These authentic Mexican coconut mask skeletons with canvas bodies are perfect for a Day of the Dead celebration or halloween decor. The skeleton heads are made from clay and natural items formed around a hollowed out coconut half shell and then baked and hand painted making each one unique. Direct From Mexico will carefully pack your order for safe delivery. Available in Black or White. Select color choice from the drop-down menu before adding to cart. 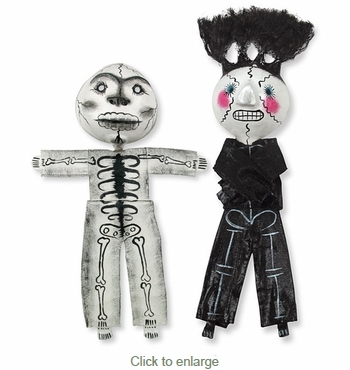 Excpect variations in size and designs on these one-of-a-kind folk art skeletons.